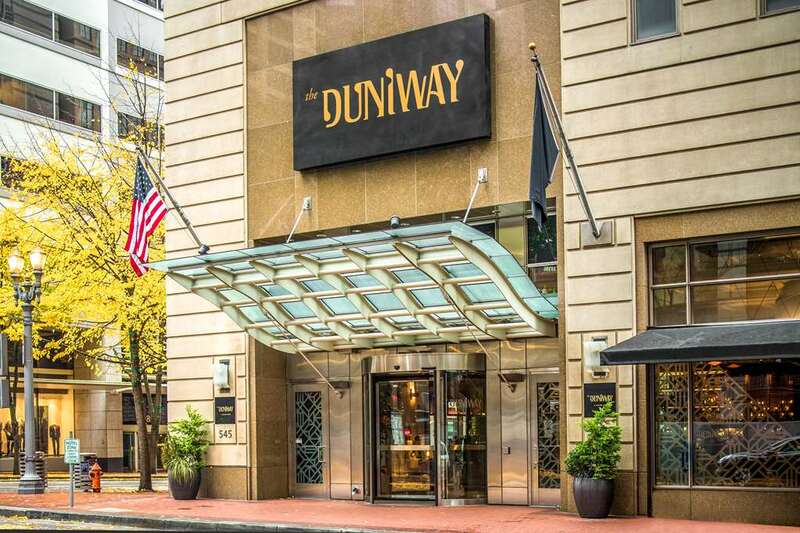 Welcome to The Duniway Portland a Hilton Hotel in the heart of downtown. Thoughtfully renovated and renamed in 2017 this Portland landmark is steps from major offices premier tax-free shopping vibrant nightlife and the MAX Light Rail. PDX Airport is just 30 minutes away. Our renovated guest rooms have luxurious beds eclectic decor and comforts like a mini-fridge and 65-inch HDTV with SoniCast. Enjoy touches of Portland like local coffee/tea and refreshing bath products. For the ultimate stay book a top-floor suite with separate living room two bathrooms and supreme views. Dine at Jackrabbit the creation of celeb chef Chris Cosentino. Open all day this restaurant specializes in shared plates house-cured meats and gin-centric cocktails. Get a caffeine boost in the lobby coffee bar or call on room service for delicious meals delivered to your door. We have guests covered at our Portland lifestyle hotel. Exercise in our complimentary fitness center or swim in the heated indoor waveless lap pool. Our business center is available daily and our convenience shop is always open. Our hotel is connected to Hilton Portland Downtown offering additional amenities and dining options. You*ll love our event spaces and wedding venues in Portland Oregon. Plan executive meetings in our two boardrooms or a social event in the ballroom. Our A/V technology catering options and dedicated staff ensure your event is a success. Prepare for your workday in the business center. The Duniway Coffee Lobby Bar: Jackrabbit has teamed up with Vittoria Coffee to offer Portland a fantastic coffee experience. Our specially trained baristas offer up many different coffee options in the morning as well as fantastic pastries made by our star Pastry Chef Julie. The Duniway In Room Dining: Room Service is available 24 hours a day featuring delectable cuisine savory desserts and cocktails and craft brews from the Jackrabbit restaurant.